Line C in New York's subway (8th Avenue line and Fulton Street line, both former IND). The simulated line starts at a track in the 174th Street Depot at northern Manhattan, from which the train goes to the 168th Street station at Manhattan to start revenue service. Revenue service ends at the Euclid Avenue station in Brooklyn, from which the train is moved off service to a track towards Pitkin Avenue Depot to change direction. Detailed line, both stations and trackside! Soft curves and realistic switches, announcement of all stations and connections. At line 20800 there is a lot of code. Change the original file's @freeobj(0,1413,0,0,0) to @freeobj(0,1407,0,0,0) and then save the altered file and you are done. 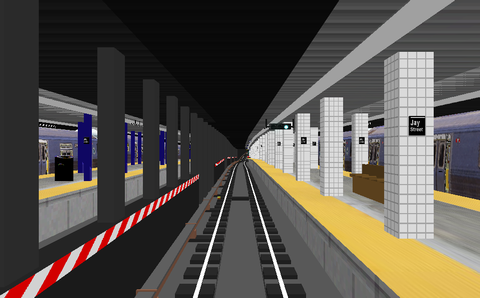 This simulation requires the NYCTA line C by The NYCTBA Team to be installed as it uses graphic objects from this line simulation. This simulation is an update of the NYCTBA Team's simulation, mainly changing all signals to the proper NYC subway style of light signals. Comes bundled with NYCTA line B by jayjay85 and others.